Dwyane Wade and the Miami Heat pulled out a surprising Christmas Day win against LeBron James and the Cleveland Cavaliers. As if that wasn’t surprising enough, LeBron had some words for his old friend in the post-game. This goes to show that even when the NBA YouTube account posts something, you never know what kind of trade rumor gold you might find in it. The Cavs have struggled of late, losing three of their last four, including the Christmas Day loss to the Heat. The highly publicized relationship between LeBron and coach David Blatt has taken such a negative spiral that Sports Illustrated recently published a photo library of the negative body language between the superstar and his coach. I asked LeBron if Blatt's the right coach for the #Cavs: "Yeah, he’s our coach, I mean, what other coach do we have?" 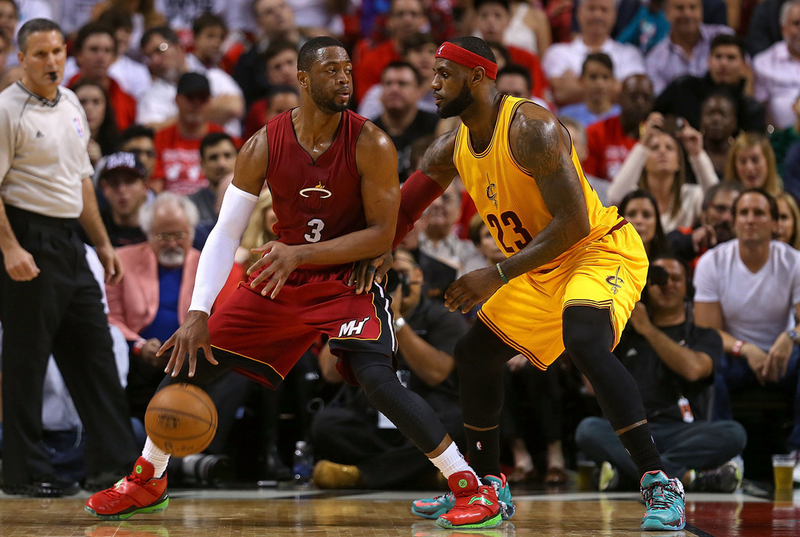 h/t for the LeBron-Wade interactions to Heat Nation. Back for Part II of our most entertaining NBA players (2014-15 edition), Daniel Fotinich and I finish off our top-5 in the league and it’s going to get a bit crazy by the end. That initial thought Fotinich had that this project would be boring? Well, we saved the best for last. Let me just say some claims have been made… Read for your entertainment! Elijah Abramson: Let me start off by saying how ecstatic I am that he is back on the court. Russell Westbrook is one of the most electrifying players in the game. When this concept for this column first popped into my mind, the former UCLA star was one of the first players that came to mind. In only his fourth game back, he threw down a MONSTER jam against the Pistons and notified the league that he’s baaa-aaack. Watching the KD-Westbrook dynamic in this play is straight comedy. But you know what? It’s also entertaining!! I gave him 9s across the board in our ranking and will thoroughly enjoy watching him and Durant vie for the eighth seed in the West. On the note of comedy, watching Stephen A. Smith proclaim the Thunder would finish in the top-five in the West was comedy in its own right. The fifth-seed is around a 54-55 win spot in the West and that means OKC needs to win 76 percent of it’s final 62 games. I don’t see it happening. Daniel Fotinich: I agree, I love watching Westbrook play. He’s the highest ranked of my“athletic freak point guards” (which also includes John Wall and Kyrie), primarily because of the raw emotion he shows. The celebrations he makes after game-changing plays are extremely entertaining. Nobody else in the league celebrates like he does. I believe that at some point in his career, he will be an alpha dog on a championship team. We need Westbrook to win a ring just to see that post-game celebration, as well as the post-game outfit. In regards to the playoffs, I agree that the Thunder are unlikely to get the fifth seed or higher. However, do you think they’ll make the playoffs? The West is loaded, and in 2008, the most lopsided year I can remember (can you remember a single decent team from the East that year besides Boston and Cleveland?! ), the eighth seed had 50 wins. I imagine it’ll be similar to that this year. I can’t find any odds on the Thunder making the playoffs, but the odds on them winning the West right now are +400, higher than for the Houston Rockets (+900). That might be because if they do make the playoffs, it meant that they peaked at the right time, so I don’t know if its relevant to analyzing if they get in. I think they just sneak in as the 8th seed, and upset the no. 1 seeded Golden State Warriors in the first round. I actually think the only way that Westbrook wins a championship is as a number-one scoring option. I’m sticking to the position I have held since the inception of Bases and Baskets in mid-2012 that Westbrook and Durant aren’t winning a championship together (especially with Scott Brooks at the helm). I think the seven- or eight-seed is reasonable which does scare me if the Warriors remain atop the conference. I was actually hoping the Thunder’s odds would drop to around +1500 or so and then very seriously consider throwing down on them as conference champions or even NBA champs. There might be some late-season “tanking” where teams jockey for match-ups. How the rest of OKC’s regular season pans out will have a lot to do with that. 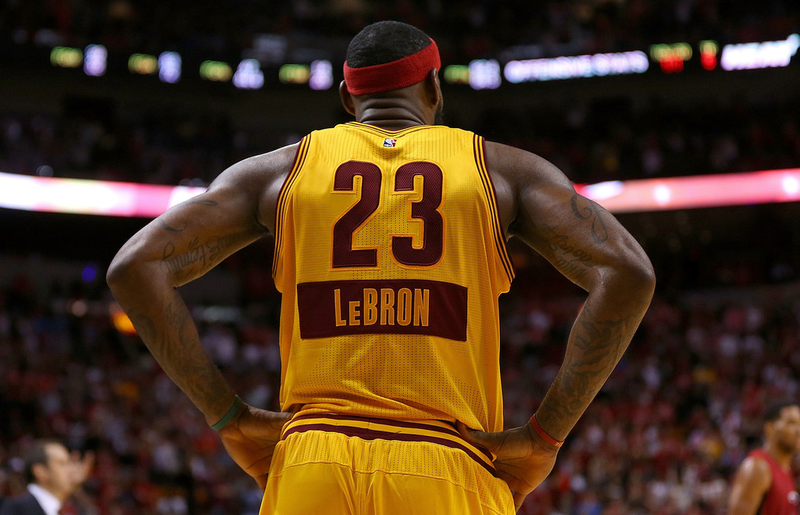 Fotinich: There isn’t much that hasn’t been said about LeBron James. Not only is he an athletic marvel, but he’s one of the very few players that has matched the hype that preceded his rise. Without a doubt, expectations for LeBron were sky high coming into the league, and his narcissistic tattoos (“King James,” really?) didn’t necessarily help things. And you know what? He’s matched and likely exceeded anything people reasonably expected of him. If he retires today, he’s one of the top 10 players in league history. He’s a four-time MVP. And in regard to entertainment, I hold my breath every time I see LeBron careening to the basket like a runaway train. If you’re a top-10 player of all time, you’re on this list. The main reason that LeBron isn’t ranked slightly higher is that we are so used to his greatness. It’s hard to believe, but this is actually his 12th NBA season. If he were to retire after this season, he would’ve already played more minutes than Larry Bird. The recent flood of articles that ask the question “Has LeBron peaked already?” only highlight his greatness further, because if he hasn’t peaked yet, you might as well give Cleveland the championship already. Abramson: The man who landed a job at ESPN because of LeBron, Brian Windhorst, actually wrote an interesting piece recently on the decline of the King’s athleticism. Like you said, even now we still expect grand things from him and his singular brilliance influences ticket prices. He’s a statistical, athletic, and entertainment anomaly. And I think calling him a top-10 all-time great is actually underselling him. In one of my new-age analysis rankings, I compared the greats and wound up with him sitting among the top FIVE greats of all time...and keep in mind he STILL hasn’t hit age 30 yet!! I agree with the premise in Windhorst’s column, though. His flashy athleticism has waned to a degree. We don’t see the same frequency of jaw-dropping freak-of-nature plays as much as we did four to six years ago. That’s why he was fourth in my ranking of most entertaining players today. Fotinich: In regard to whether he is in decline, we need more information, but its certainly possible.. The 30-point loss to the Hawks the other night was embarrassing, and while that isn’t all on James, he’s failing the eye test in regard to his strength. The Paleo diet may have been the wrong choice, since he’s sacrificed his signature brute strength for athleticism, which might not have been an appropriate choice given his age and wear/tear. I think your prediction of LeBron shooting 57% from the field this year is working out just as well as my “Lance Stephenson the All-Star” prediction. While I disagree with you that LeBron is a top-5 player of all-time if he retires today, I will admit that even 50 years from now, people will remember that they saw him play. His stats look like they’re from a video game. On another note, Windhorst should definitely be paying at least a 25% royalty on his paycheck to LeBron. Abramson: Shhhhh, 57 percent? Who said that? 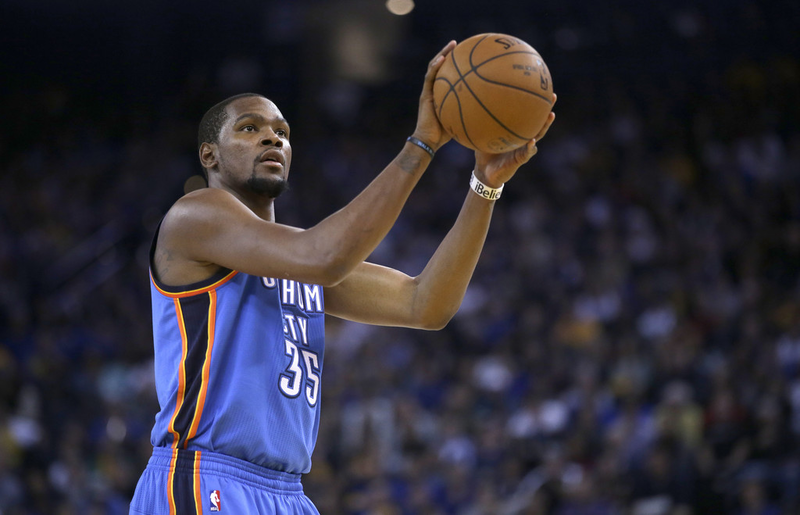 Abramson: Watching him go down in the Warriors-OKC game on December 19th was brutal. He was LIGHTING up the best defense in the league. 30 points in 19 minutes… that’s just not normal. He toys with defenses like Ron MettapeacePanda would with anyone who physically challenges him. Hopefully he's back from RE-injury soon. Basketball, at it’s finest, is an art. Durant has the mastery of the offensive game like one of two players in the game today (the other whom I gave a perfect 30 in this ranking…). It’s beautiful to watch someone like him pull-up from three, step-back at the elbow, then throw down an alley-oop. For a slender figure, he sure has proven you can succeed even if your upper body doesn’t look like Michelangelo chiseled it from some ideal basketball physique. There’s a lot to love about the OKC superstar. He was no. 2 in my ranking for all of these reasons. I love me some LeBron James but offensive basketball as an art is Kevin Durant. Fotinich: I still remember when Kevin Durant couldn’t bench 185 pounds before the NBA draft in 2007 and everybody wondered, “Wait, is this guy trying to play small forward?” Fast forward seven years, and Portland taking Greg Oden over KD seems as bad of a mistake as taking Sam Bowie over Michael Jordan (that was Portland too?! Oh, ok). The first time I watched KD play for an extended period of time was the Lakers-Thunder first-round series in the 2010 playoffs. The eighth seeded Thunder took the Lakers to six games, and were one Gasol offensive rebound away from going back to Staples Center with a chance to pull off the shocking upset. However, Metta World Peace (then known as Ron Artest) locked KD down throughout the series, holding him to 35% shooting and an even lower % from 3. I watched the series wondering how KD would ever shoot 45% from the field, given the types of shots that he was being forced to take. Since then, he has refined his game in every aspect and has become the best offensive player in the league. Shooting 50% from the field is already incredible in the NBA, but its even more incredible when you’re mainly shooting jump shots while being double-teamed. The best adjective I could use to describe KD’s game is “smooth." It has been amazing watching KD grow, and I still believe that he could average 35ppg in a full season. Abramson: There’s no doubting he was a premiere defender in his heyday but Metta WorldArtest is now known as The Panda’s Friend...but realistically who can keep up with his name changes? He’s definitely his own man and has had an interesting path of nicknames while The Slim Reaper never caught on with Durant. I think he’s okay with that though, his Nike deal was astronomical. 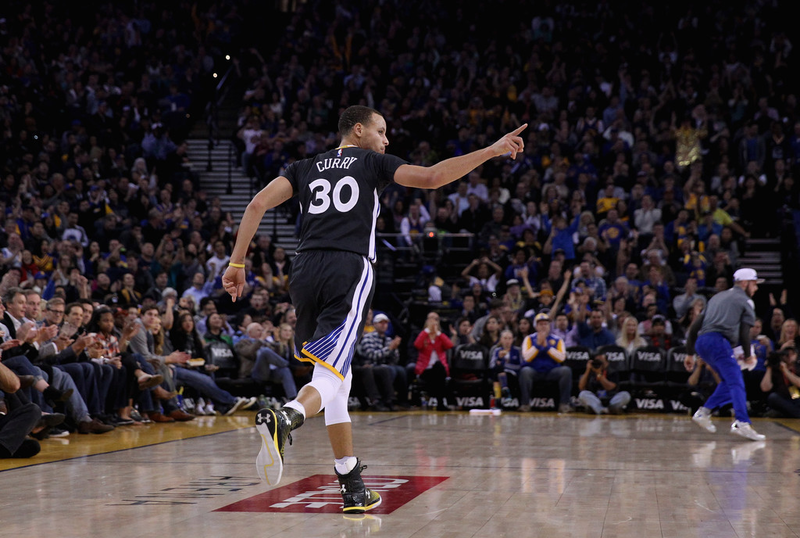 Fotinich: Non-biased opinion here - Steph Curry might be my favorite player to watch today. I’ve always been a fan of great shooters, and Curry might be the greatest shooter of all time. Here’s the most fascinating part about Curry’s career 43.4% three-point percentage. Just about all of the guys historically known for their three-point shooting have been exclusively catch-and-shoot guys (Kyle Korver, Steve Kerr) or primarily catch-and-shoot guys (Reggie Miller, Ray Allen). Curry is the primary ball-handler on this Warriors team, so he catches-and-shoots about once in a blue moon. I don’t have any “next generation stats” on this, but I’m pretty sure that almost all of Curry’s three-point attempts are contested. And he’s still shooting 43%? That’s amazing. In advance of Kobe’s retirement, I’m also nominating “Curry!” to become the phrase to shout when somebody makes a crazy shot in a pick-up game. He’s that good. Abramson: Hmmm… You had one player ranked higher than Steph on the most entertaining players ranking so I need a bit of clarification on how he can also be your favorite player to watch. I equated most entertaining with favorite to watch hence why I gave Steph the only perfect 30 and my top spot in this ranking. In my basketball-watching lifetime, the most entertaining players to watch (no particular order) to me are: Shaq, Steph, Durant, Westbrook, The Answer, Wade, and the Suns rendition of Amare (still have a poster of him somewhere in my room…). I’ve written extensively on Steph here on Bases and Baskets, most recently on a well-received feature on his much improved defense. Not sure if I’m the captain of the boat but I have to be up there leading the S.S. Steph in saying he’s the best PG in the league (since April), a top-five player in the NBA, and I even wrote up a specific comparison saying that he’s better than Russell Westbrook. Not sure how that Westbrook comparison is looking right now, but to me, Steph has to sit atop the ranking of most entertaining NBA players. Fotinich: I’ll clarify exactly why I put one player ahead of Steph in a moment, but its absolutely a close call. He’s a solid no. 2 in my opinion. It also makes me relieved that his ankle problems seem to be an issue of the past; we haven’t been hearing about that in over a year. Golden State didn’t give him the full max mainly due to those recurring issues, and since that extension, he’s been the best value non-rookie contract in the league. Steph ($10.6m) is making less than JaVale McGee ($11.3m) this year! I saw Steph play in person during Kobe’s 34-shot game earlier this year, and he makes shooting threes look so effortless. His shot gets off faster than most guys in the league (I don’t think I’ve seen a Steph three get blocked), and he can shoot it from anywhere. Its amazing to watch. Abramson: Although I had him third, the law of averages brought up him to no. 1 and I can’t say that I’m surprised. We’ve both jockeyed for our own guys (I have Steph and KD ahead of BG) but in the end, the finishing half of Lob City got the no. 1 spot. This is hard for me because as a Warriors fan, I detest the Clippers. 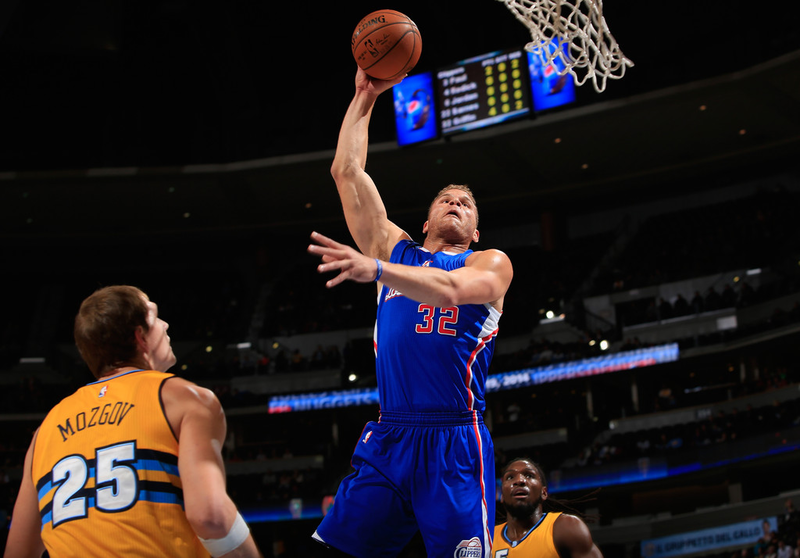 However, it’s hard not to like Blake and DeAndre as a tandem. (One of the ESPN guys compared DeAndre to Bill Russell on Christmas but that’s the subject of a whole different column.) When you think of star factor (he’s in LA), unique factor (daily posters), and WTF factor (did he pull up from 20 and then just take Draymond to the rim off the dribble for a flush?) he has each going for him. New Hollywood soap opera anybody? Fotinich: I picked Blake first, and to me, its an easy choice. Having been to several Clipper games since they drafted Griffin, I know the unwritten rule: “Never leave your seat when Blake is on the court”. I broke this rule during my first Clipper game, and when I returned to my seat, my little sister was sitting with her mouth agape. Of course, I missed a signature Blake Griffin jam. Without a doubt, Griffin has evolved into a more complete player over the past few seasons. He’s averaging 4.7 assists/game (seriously) and shooting more consistently from outside of ten feet. As for his entertainment value, however, its his ridiculous dunking ability that earns him my no. 1 spot. I’ve never seen any of the greatest dunkers in person, but from watching highlights and reading articles, I agree with many that Blake Griffin is the best dunker in history. Dunking has been central to NBA entertainment for years, so it makes sense that the best dunker is ranked as the most entertaining player in the NBA. His near-fight arguments with opponents (seemingly during every game) boost his entertainment value even further. In regard to the Clippers themselves, I can’t believe that they’re only sixth in the West despite being on pace for a 55-win season. I still think they have as good of a chance as anybody to make it out of the West, but it will be a bloodbath throughout. Regardless, Blake Griffin is the most entertaining player in the league. HOLD UP. There can be debate over many things in the NBA, I’ll give you that. But if we’re talking about best dunkers in modern era players and not including the game-changing value of guys like Dr. J and Clyde the Glyde or The Human Highlight Reel, this question is a can of corn. Vince Carter is hands down the greatest of all time. There is no debate. And somehow THIS dunk didn’t even make it on there!! Blake Griffin, the greatest of all time? You should be disqualified from basketball analysis for saying that. The combination of power and acrobatics from this guy was bar NONE. And what about Jason Richardson??? I’m still shaking my head. We’ll see if anyone reads this far and comments on this subject. I do appreciate the nostalgia of re-watching some Vinsanity, though, so thank you for that. This guy was a piece of work and man...if only he and T-Mac stayed together in Toronto. The Raps would hardly need the publicity from Drake. As I’m recovering from the shock of reading Blake is the greatest of all time, I must say this has been an enjoyable 5,000+ word double-column. In the end, basketball needs entertainment to fill the seats. And Steph Curry, BG, KD, LeBron, and Kobe are a privilege to watch. Seven Lakers (9-19) scored in double figures en route to a 115-105 victory over the Warriors (23-4) on Tuesday night at Staples Center. The loss was just Golden State's second in its last 20 games. The emergence of Marreese Speights has made all of the difference for the Golden State Warriors. The fact that David Lee has been injured most of the season, and the team still has the best record in the league is a sign of how good they truly are under new head coach Steve Kerr. We all know that Stephen Curry and Klay Thompson are the straw that stirs the drink for Golden State, but you have to give credit to Harrison Barnes for consistently hitting a wide number of outside shots when called upon. With Kobe Bryant given the night off, Carlos Boozer led L.A. with 18 points, while finishing one rebound shy of a double-double. Ronnie Price’s 17 points were one away from his career-high, and he also recorded eight assists and three steals. Ed Davis connected on all seven of his shots to end with 14 points, while Nick Young (15), Wesley Johnson (14), Wayne Ellington (12) and Jeremy Lin (11) all surpassed 10 points. This article was written by a guest writer. 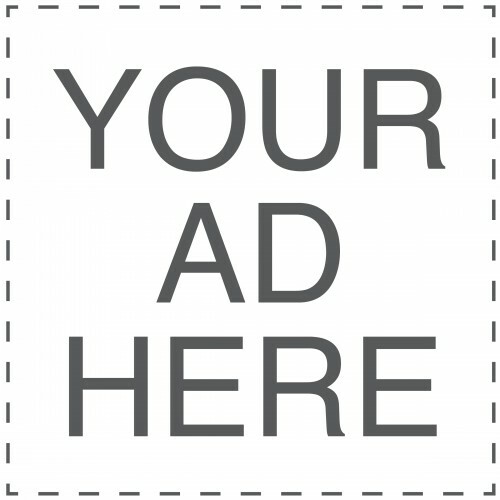 Please contact our support team if that is something that interests you! 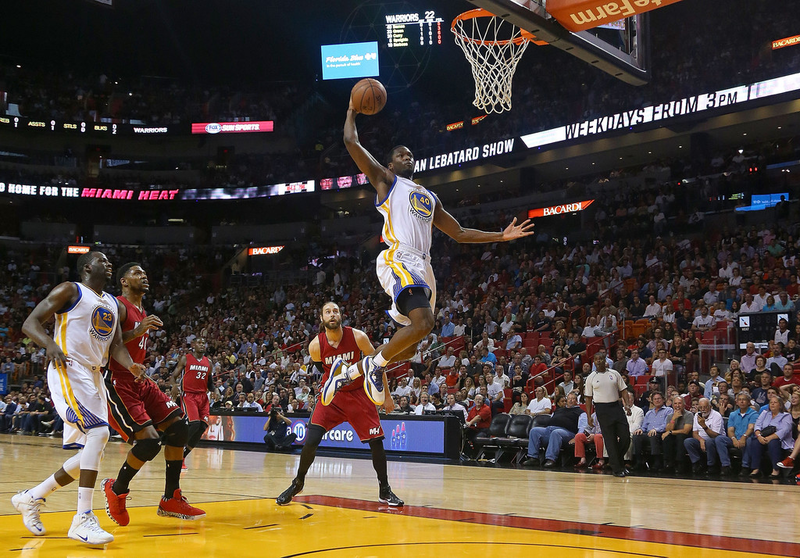 Just last season, doubts swirled around the Bay Area as to the future of the seventh pick in the 2012 NBA Draft, Harrison Barnes. A huge part of the Warriors playoff run in 2013, Barnes put up two 20-point games in both the San Antonio and Denver series. His production mysteriously bottomed out the following season. In 2013-14, the former University of North Carolina star scored less than 10 points per game and under 40 percent in both the regular season and the playoffs. As if the roller coaster ride was over, Barnes has returned to 2012 form this season. New coach Steve Kerr entrusted Barnes with the role as a starter over All-Star Andre Iguodala. The decision has more than paid dividends for Barnes’ career and confidence who is sporting career-highs in many traditional shooting stat categories (points, FG%, FT%, 3PT%). A closer look at Barnes’ transformation in Steve Kerr’s offense and defense shows that this is no accident. Mark Jackson has already been critiqued a lot, most notably by the recent comments from Warriors co-owner Joe Lacob who said at a VC luncheon that Jackson “couldn’t get along with anybody else in the organization…you can’t have 200 people in the organization not like you.” I don’t want to harp on Jackson’s faults more than has already been done, but Barnes was one of the players most negatively impacted by the lack of offensive scheme and movement. From a Curry standstill dribble, Barnes is waiting on the wing with no movement or initial advantage on his defender. Bogut is already in the high-post/free-throw line area which is actually not a bad thing (as the Warriors have shown this season). The problem here is that Curry, not Bogut, is the playmaker. Diaw is a crafty defender but Barnes can certainly beat him off the dribble. Then Splitter sags off Bogut because the big man has a range of about three feet from the basket. In traffic, Barnes pulls up and misses. When you’re a struggling scorer, these are not the types of shots you want to be taking. As recently as the 2014 Finals, we see how stars like LeBron would look to get their sidekicks like Wade back on track. Alley-oops and easy backdoor lay-ups were the way to go. It helped even then, although those Spurs made Miami look like a D-league team in the '14 Finals. And while the pedigrees for Barnes and the Warriors aren’t on LeBron-level, the premise is the same. Bogut as a facilitator? Check. No double team? Check, unless you count two guys behind you. And an easy lay-up? Checkmate. The chess game that Steve Kerr plays leads to consistent baskets like this. With P&Rs mixed in with dribble hand-offs, backdoor cuts mixed with plays like this, Barnes and the Warriors get easy baskets. So when Charles Barkley proclaims that the Warriors need a post presence to get easy baskets, these are the plays I would point out to him. Same theme as before. Barnes is not (yet) a shot creator like Steph Curry. What he can do very well, like his teammate Draymond Green, is make open to relatively-open shots. This leads to greater efficiency (hold that thought for now). Quantification of Barnes’ shot selection supports this claim. And if you’ve read any of my other feature columns, you won’t be surprised that it's time we dive into some advanced metrics. 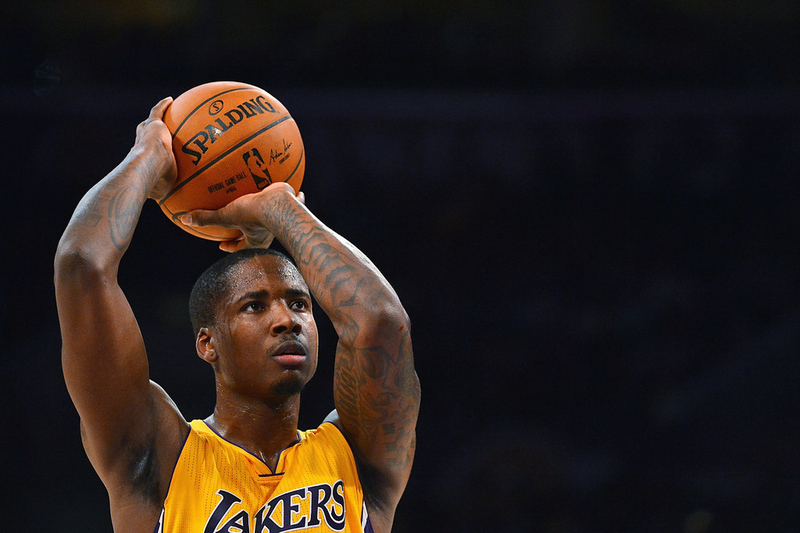 Through 21 games, 73% of Barnes' baskets were off assists, up significantly from 61% last year. Translation: he’s getting a higher percentage of easier baskets. Quality of shots is also measured by proximity to the paint. The mechanics to Barnes’ shot still have me slightly uneasy, but maybe that’s an off-season project for Alvin Gentry. It’s far from 2013-MKG but I still see room for a silkier shot. Remove the necessity to square up a shot by getting shots in the paint. Specifically in the restricted area, Barnes is shooting 70.4% vs. last year’s 55.3%. Was he really that bad last year or has he just gotten lucky? Neither. Again, let’s take a look at the percent of those (restricted area) field goals that are assisted. Last year 59.6% were assisted, and this year, 73.7%. One final measure of ease-of-shot that I find useful is looking at the number of dribbles taken prior to a shot. This gives a better distribution than simply “catch-and-shoot” vs. “lay-ups” vs. the other 10,001 ways shots can be classified. And it’s also valuable because it lumps together generally difficult shots and generally easy shots even if they’re different types of shots. A one-dribble post-move and a step-back three are both relatively easy shots even though the chance of making each shot varies tremendously. So while a three is a lower percentage shot (statistically) than a shot closer to the basket, it’s still relatively easy if it’s a catch-and-shoot three. In the words of Andre Iguodala (referring in this case to Klay Thompson), “I can get a dunk for 2 pts or a layup for 3 pts.” Barnes, like anybody, wants easier shots…and he’s been getting them. Confidence is critical to shot-making, and more easy shots make the difficult ones less daunting. Barnes exemplifies this standard perfectly. The value of his increased efficiency is not limited to just zero- or one-dribble shots around the basket where those pump-fakes that he throws up in the paint work so well. He is shooting a staggering 45 percent from three this year, up 10 points from 35 percent last year. 64% true-shooting isn't half bad, either. Barnes’ rebounding has also improved. In 31 minutes per game, he’s hauled down 6.4 rebounds per game. And as with his shot selection, not only has the quantity increased, but so has the quality. The rebounds that he’s getting are both closer to the basket and among greater number of contesting rebounders (ie more players going for the ball). Rebound in traffic? Just a bit. 3920 pump fakes? I stopped counting after 1000. Great body control and footwork? Kobe would be proud. And a basket close to the rim? As close as you can get. This shot even got a nice little fist-pump from Steve Kerr. Last year, Barnes was forced into a role as the primary scorer in a second squad. He’s not that player yet. Especially as a young player, he needed/needs the right situation and lineups. Kerr is bridging the gap and providing just that, giving Barnes time with both the starters and the bench players, and often with combinations of both. This is great for him because he gets the opportunity to build confidence as a third or fourth option. Then he can carry that confidence over to the second squad, something that will help build his individual talent as a primary scorer. He gets minutes with the starters (started every game so far) but also sees plenty of time with Livingston, Iguodala, Barbosa, Speights, and the bench. Each player has benefited individually from Steve Kerr so maybe the three Warriors that I’ve featured in columns so far should be under a series dubbed (no pun intended) The Steve Kerr Effect. Barnes’ change is unique, though, and definitely sticks out. Most every other player on the team was on a trajectory to improve (albeit maybe not at the rapid rate it has been). Barnes, however, was a huge question mark for the team after last year where his highlight reel was still really only that nasty dunk on Pekovic…a throwdown from 2012-13, the previous season. That has changed. Barnes may not be a viable no. 2 scoring option on a team but he is a solid starter on a great team. Not many players can claim to be a starter on a franchise-record regular season win streak. Draymond Green gracefully filled the role that the Warriors had intended for the now-Cavaliers forward Kevin Love. The then-Timberwolves All-Star Kevin Love provides floor spacing and scoring from the power forward position, something of extreme value to rookie coach Steve Kerr. The price-tag there was Klay Thompson and change plus a $15 million a year contract. Instead, the affectionately-known Treymond has buried open three-pointers like Kyle Korver while defending just about anybody. On Saturday against the Chicago Bulls, Green put up a career-high in points (31) and threes (7) in a single game against one of the league’s stingiest defenses. The elephant that will slowly creep its way into the room is: what is Draymond Green’s value as he encroaches upon free agency? Two of my personal new favorite defensive metrics (that show the improved defense of Steph Curry, as well) are opponents FG% difference (DFG%) and DFG% differential. DFG% calculates the FG% that a player holds on opponent to, and DFG% differential calculates how that compares to other players. For example, if Derrick Rose normally shoots 45 percent from the field and he shoots 40 percent from the field when Steph Curry is defending him, then Curry’s DFG% would be 40% and his DFG% differential would be -5%. Negative DFG% means you’re a good defender, positive DFG% means you’re a poor defender. With all of this in mind, evaluating his ceiling is a daunting task. Green’s ability to contribute offensively has improved exponentially throughout his tenure in the NBA. Warriors fans have seen it and the stats verify it (minutes, points, 3P%, rebounds, assists, and many advanced metrics). This is something that bodes well for Green’s green, but not so much for the Warriors, who are already projected to sit well above the cap for the 2015-16 NBA season. The maximum salary that Draymond, who has been in the league for less than six years, could sign for is 25% of the total salary cap. For the 2015-16 season that (cap projection: $66.5 million, luxury tax threshold: $81 million) that translates to roughly $16 million. Draymond’s qualifying offer is $1.1 million for next year, something that puts pressure on the Warriors to give him an extension unless they are willing to let him become an unrestricted free agent in the following year. Golden State, however, already has $82.5 million committed to players next year…not including Draymond Green. Their core of Curry-Thompson-Iguodala-Bogut owns $51 million of the cap. Depending on how far Joe Lacob and the Warriors ownership is willing to go into luxury tax territory, this probably means they must shop David Lee and his exorbitant $15 million contract. We haven’t even mentioned the contract of the rejuvenated Mo Speights who will command more than the $3.7 million he’s currently pocketing. Conservatively, Draymond falls around the Nic Batum/Jeff Green/Luol Deng/Ryan Anderson level of small forwards which is somewhere between $9-12 million per season. Stir in his youth and potential with the upcoming TV deal, and we’re looking closer to the equivalent of today’s max contract. Klay Thompson sacrificed a jump in salary once the TV deal goes into effect for the security of a four-year/$70 million extension now. If Green is willing to follow suit, a four-year extension for $55 million (about $14 million per) should be enticing. How and if the Warriors front office can finance an offer like that prior to the new TV deal remains to be seen. I would place Draymond’s ceiling value under an $88 million cap at $17-20 million per season…a significant jump from the $14 million if he was given a four-year extension at the end of this season. You would be hard-pressed to find a team around the league that would not like this guy. In the days of Chandler Parsons’ contract, there will someone out there who throws an inordinate amount of money to lure Draymond away from the Bay Area. Green would fit in very well in Memphis in a defensively-minded organization with a lack of a small forward. 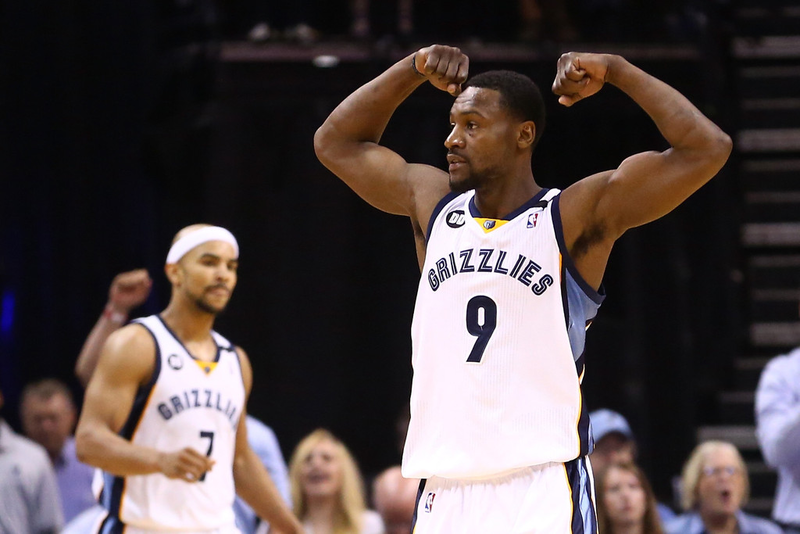 With a Defensive Player of the Year defending the rim, he and Tony Allen chasing around the opposing player’s best perimeter players would be suffocating to opposing offenses. Then there's the Spurs. Tim Duncan will likely retire after this season and even after signing Kawhi Leonard to a new contract, San Antonio will have enough room for a max player and then some. Diaw, Leonard, Bonner, and Draymond would be a versatile rotation of forwards for Gregg Popovich. This list goes on. The pressure is on the Warriors to lock him up sooner rather than later. There is a caveat here…and I say this with nothing but respect, as you can gather from my valuation of him and the fact that he is probably my second favorite player in the league. 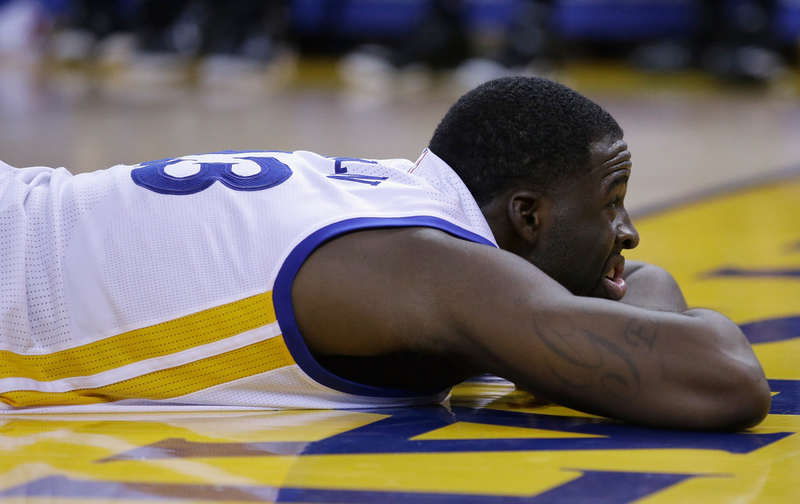 Part of the inspiration to this column was my devils’ advocate argument (sorry, Draymond). I have no doubt that his defense and energy will translate anywhere. No doubt that he has proven that he can improve drastically season-to-season. No doubt that he can knock down open threes. However, he has benefited extraordinarily from his surroundings. The gravitational pull of Steph and Klay for opposing defenses combined with coach Steve Kerr has skyrocketed Draymond's value. The threat and passing ability of the guards combined with top-notch shooting has allowed Draymond's scoring to soar. If he is a second or third scoring option on any another team, defenses will guard him tighter, and I don’t think he is yet ready to respond to that. While he is clearly great with a head of steam going to the basket, his handles aren't there to create as a playmaker in the half-court. He’s somewhere between Shane Battier and Kawhi Leonard. This is where the Warriors front office could get bold, and whether or not that's a good thing remains to be seen. The market value for the 24-year-old could fall into the $7 to $8 million ballpark if his production offensively slows down come January or February. Does Lacob and the front office allow Draymond to test the market in a risky effort to decrease their financial obligation to him? Keeping the six- or seven-player core that they have established would be nice, but that’s only financially possible under the current CBA if Green is in the single digits per year until the new CBA (or the Warriors drop a big contract or two). 1) Steph Curry, 2) Andrew Bogut, 3) Klay Thompson, 4) Draymond Green, 5) Andre Iguodala, 6) David Lee. The value-to-cost ratio is through the roof for Draymond as a Warrior. It would be wise of the rising Western Conference powerhouse to lock him up for four years and between $45 and $55 million. The most recent example of breaking up an organically formed close-knit team was the Big 3 in OKC, with Kevin Durant, James Harden, and Russell Westbrook. Golden State refused the Kevin Love deal; they should continue on the path that has led them to a franchise-best 12-game win streak. You don't want to make the same mistake that OKC did. More than any other professional sport, the NBA is driven by its individual talent. The great and unique aspect in this is that this doesn’t necessarily just mean superstars. While LeBron James drives TV ratings through the roof, there are a host of players out there who are must-watch in their own right. And so we arrive with Daniel and Elijah’s ranking of the most entertaining players in the NBA for this 2014-15 season. Daniel made his debut on Bases and Baskets about a month ago with some bold predictions for the new NBA season and is ready to follow it up by going head-to-head with Elijah’s heavy-hitting opinions (jokes, people...). Seriously though, this should be fun with his Kobe homerism and my (proud) Kobe hating tendencies. Michael Jordan, Magic Johnson, Larry Bird. These guys transcended just the game on the floor. These are the guys you tell your grandkids you watched play. Those guys fall around a 10 give or take nothing. Some guys have pull just because of their name. For perspective, Klay Thompson and Ricky Rubio are around a 5 or a 6. This is the Dennis Rodman/Ron Artest factor. There are always those guys that are ticking time bombs, you never know when they’re going to take a trip to North Korea or jump into the stands and beat up a fan. Also could apply to a “WTF just happened Kobe scored 20 in the third quarter against the Warriors”, or “WTF, could a random guy on the street have a legitimate chance to shoot a higher percentage from 15 feet or beyond than Ricky Rubio?” This is an all-encompassing WTF. Some players do things you just shouldn’t be able to do. Vince Carter jumps through two gyms. Anthony Davis can block a shot, dribble the length of the floor, and pull up for a jumper. Dwight Howard’s shoulders could level a small car. Players that score highly in this ranking are those who want to watch because you might never see another guy like him. We had some ties, so this top-10 is actually a top-11, but let’s jump right in. Daniel Fotinich: We agree! I can’t even believe it. Maybe this column will be more boring than I was anticipating! Kyrie is a pretty simple case of entertaining - he’s an electric point guard who can get to the rim in a flash at any moment. For three years, he played on a team that totaled 78 wins and didn’t sniff prime time because his best sidekicks might’ve been Dion Waiters, Tristian “making an extra $15m because I hired Dan Fegan three years ago” Thompson, and Andrew “I actually shot from beyond the half court in a practice scrimmage just to get cut” Bynum. Now that he’s on a team with LeBron and Kevin Love, seeing Kyrie in the playoffs is a virtual certainty for us! Are you excited yet?! Zach Lowe made a great point on The B.S. Report with Bill Simmons on the 11/11 podcast that I think is at least partially valid: Kyrie could be destined to be this era’s version of Stephon Marbury or Steve Francis. All three of those guys are incredible basketball talents who were me-first players to a fault. You know who this reminds me of… Kobe Bryant! The difference is that the all-around skillset that Kobe brings to the table supersedes the My-Way-or-the-Highway stars a la Franchise or Starbury. No doubt that the Kyrie-LeBron dynamic is one to watch throughout the season for this very reason. Hopefully Kyrie’s peak isn’t as the best guy on a 44-win team (as Lowe suggested), and David Blatt can make it work. If he can’t, GM LeBron will have Kyrie shipped out to sea. Fotinich: We’re barely 300 words in and Kobe is already in the conversation?! That definitely speaks to his star power (more on this later). I’m excited to see what David Blatt cooks up in Cleveland. So far, the results have been uneven to say the least, but the first few games of a season rarely mean too much (besides for the 76ers, who should be eliminated from the playoffs for the next five years after that game against Dallas). Isn’t it phenomenal that a 6’8” small forward might actually be better at playing point guard than Kyrie? Should they actually let LeBron play point at times? Regardless, I think this team could win the East based on talent alone. They’re actually getting -140 odds to win the East even though they’re 5-4! Nobody in the league is as stacked as the Cavs – they have a top-4 PG, a top-3 power forward, and the best player on Earth. Save for Oklahoma City at full health, they are by far the most talented team in the NBA right now. Abramson: John Wall and Russell Westbrook are in a category of their own in terms of athleticism and basketball talent. These guys slice through defenses like, in the words of the great Wiz Khalifa, it’s nothin’. And it’s fun to watch. Derrick Rose would be in this Wall-Westbrook conversation as athletic-basketball freaks but I find Rose’s recent comments disgusting… Worried about his knees and ankles for meetings and his son’s graduation?? Are you kidding me?! This guy is making tens...maybe eventually HUNDREDS of millions, and he’s worried about his knees? I don’t even want to start talking about how ridiculous this is. I’m with Charles Barkley, these comments were just plain stupid. This is veering off topic but I just had to say something about him and didn’t want to write a full column on it. Thankfully he won’t grace this ranking of the NBA’s most entertaining players. Fotinich: I haven’t caught too many Wizards games this year, but I watched them slice up Chicago last year before succumbing to the reincarnated-for-one-series Roy Hibbert in round 2. One thing that I noticed is that Wall has excellent court vision; he seems to know when a shooter is going to be open for a corner 3 about 5 seconds before it actually happens, and he hits that pass every time. Not to mention that he’s an athletic freak who gets to the rim at will. He can even shoot 3s now (after shooting 7.1% in 2011-12)! Hold on, how is it possible that 2010 Kentucky had John Wall, DeMarcus Cousins, and Eric Bledsoe on one squad and didn’t even make the Final Four? I couldn’t agree more about Rose. After experiencing knee surgery recently I wouldn’t wish chronic knee problems on anybody, but plenty of people work who in oil fields and copper mines suffer from chronic respiratory conditions (among many other issues) for years after they retire while making less than 1% of what Derrick Rose will make this year. I feel sorry for Chicago fans. Every single projection about Chicago as a top-tier contender includes the phrase “if Derrick Rose is healthy”, and his attitude doesn’t give me a bit of confidence that this day is coming. 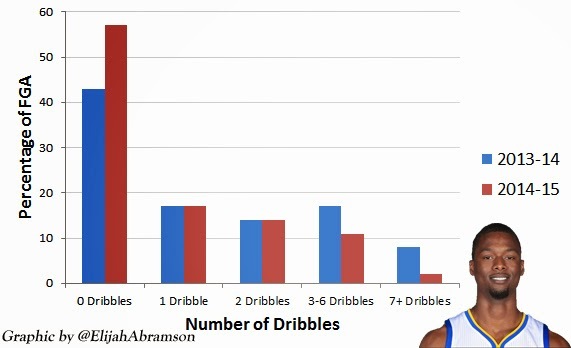 Abramson: Ricky Rubio??? This one is all you. You ranked him five spots ahead of me. More entertaining than Klay Thompson? Melo? Kevin Love, sure, but there’s no way I’d rather watch Rubio than Melo or Klay. Ditto for the two guys tied for 10th in this ranking. Rubio’s flashy passing will get a fair share of oohs and aahs but there’s no way I’m putting much stock into a career 37 percent field goal shooter. I may be a Warriors fan but let me quickly give my reasons for Klay: vying for a spot in the league’s scoring leaders, stellar perimeter defense, and an ability to drive and finish at the rim. Plus, an entire episode on Comedy Central could be devoted to nothing more than a montage of his facial expressions. Rubio is in double-digit assists for the first time this year which is far from a surprise but that’s really all he can do. I’ll pass this one off to you because Andre Iguodala’s classic did-I-really-foul-that-guy pose is about how I’m feel on this Rubio ranking. This tape speaks for itself. There’s a reason there is nine minutes of killer footage in just a year and a half of play (the tape was put together in early 2013). Come on, Rubio’s the most exciting passer the league has seen since Jason Williams, forever and always known as White Chocolate. What’s most impressive about watching Rubio is just how quickly and nonchalantly he does these passes. If somebody asks during a Wolves game, “Wait, did Rubio just pass that ball between Nic Batum’s legs?” I’m not the least bit surprised. Passers like this come around maybe every ten years. I was very surprised that the Timberwolves extended Rubio before seeing some improvement this season, even though the rising salary cap makes an extension far less of a burden. I argued in my bold predictions column that the extension would occur after the year, seeing as it made sense to wait to give $10m/year to a career 37% shooter, but the Wolves clearly thought otherwise, mainly because of his superior passing skills. Regardless of whether he will improve as a shooter, his passing is box-office. He probably isn’t even the best passer in the league today, but he is the most entertaining one. Abramson: No doubt that this guy’s passing is as entertaining as it gets. He brings that streetball-esque play to the NBA that is definitely reminiscent of guys like Jason Williams and Steve Nash. Like you, I gave him a very respectable 8 on the WTF Factor. I just don’t look at him as a star (gave him a 5). Maybe a 6 was a bit strict in terms of the unique factor, but I think he’s not on the Curry-Durant-LeBron-BG level of a 9-10. In terms of the extension, the inevitable spike in the salary cap makes $13m/year look less impressive than it would in years past. And others predictions of Rubio’s worth in the eight-figure realm made it seem surprisingly reasonable. Amin Elhassan preached the Rubio gospel last month on The Lowe Post, as well. Personally, I’d rather watch Klay go on one of his regular unconscious shooting tears and much-improved aggressiveness in attacking the rim, but I can definitely appreciate Rubio’s entertainment value. Fotinich: I seriously can’t figure this guy out. When Lance is fully engaged, he’s a two-way demolition derby, capable of scoring 25 while locking down any of the top wings in the league. When he isn’t engaged, you get 2 points in 27 minutes such as in the game against the Pelicans a few weeks ago. He’s one of the most maddeningly inconsistent players out there, which definitely makes me worry about my prediction that he will average 20/5/5 this year (his rebounds and assists are there, but the points could use some help). He’s also a headcase - I’d be shocked if there was a coach in history who ever said “I’d love to coach Lance Stephenson!” - which probably cost him $15 million this summer. However, this is what makes him so entertaining! He’s literally a ticking time bomb. In the past eight months, Lance fought with teammate Evan Turner in the locker room and blew in LeBron James’ ear, while being completely unapologetic afterwards. He’s definitely entered Simmons’ “Tyson Zone”. What headline would you need to see on ESPN regarding Lance to be surprised - “Lance Stephenson slaps teammate Al Jefferson in the face after argument over a $50,000 poker loss”? That wouldn’t shock me. And his flop against Harrison Barnes last week? It might be described “unethical” or as “an embarrassment to the league”... but I’d describe it as “hilariously entertaining”. Abramson: So you’re ready to drop the ball on that 20-5-5 prediction that you thought was a virtual lock? Or what about that virtual lock for the All-Star team? He definitely hasn’t fit in as well as was expected with the Hornets, something that has a lot to do with the fact that he misinterpreted what his role was going to be. With Kemba Walker and Al Jefferson already having made Charlotte a viable playoff contender, Lance’s antics weren’t going to suddenly grab the reigns and start running the franchise (which is what Born Ready was ready to do). However, his place among the most entertaining players is without question. We know that he brings energy, passion, and a wild side to the floor that is capable of landing a headline on any given night. But for reasons like this flop, I would argue Lance’s entertainment value has a lot to do with self-deprecation. There’s a reason that YouTube’s second-ranked autofill to “Lance Stephenson flop” when you type in his name. (First is that horrendous rap he did a few months ago.) But hey, if self-deprecation is your thing, Lance, you’re doing fabulously well in entertainment value! Fotinich: It was a bold prediction for a reason - it wasn’t likely to happen - but it was definitely one that I felt confident in. I’m not throwing in the towel yet even though he’s 10ppg behind… Lance, start shooting more! There are so many “what-if’s” you can think about with Lance. What if Lance was drafted by his hometown New York Knicks? On one hand, he would have a much larger platform for his self-deprecating entertainment. On the other hand, would he have ever become as good of a player as he is, or would he be too busy doing Lance Stephenson things? To some extent, I think Lance needs to stay in a small-ish market just to remain sane. If not, he’ll soon be being mentioned in Nicki Minaj lyrics. Oh wait, that already happened? Never mind. Fotinich: His stats alone this season probably justify more than a 6. 25 points, 11 rebounds, and 3 blocks per game on 56% shooting? Those are Shaq c.1995 numbers. I guess the reason I gave him a relatively low rating is that when I watch him, he doesn’t quite look as dominant or physically imposing as some of the greats. He averages those numbers as under the radar as he possibly can. Basically, he seems like the polar opposite of Dwight Howard. He’s an amazing player, but he’s not as entertaining to watch as those numbers might suggest. People usually talk a lot about draft busts, but what about the players that turn out exactly how they were projected to be? An NBA draft report in 2012 summarizes the thoughts of most analysts pre-draft, saying that he has “Fluid athleticism, incredible length and guard agility in a 6’10 package.” Is that not the most perfect description of Anthony Davis in the NBA? Its amazing that Damian Lillard won Rookie of the Year in 2012-2013 as a unanimous selection. Abramson: Not as fun to watch, eh? That’s what I like to call the Michael Jordan Syndrome in full effect. We’ve become so accustomed and attracted to high-flying, scoring-machine, ball-handling wizards that attention spans for the game’s bigs has decreased dramatically since the early 90s. There are exceptions to this rule (a la Hakeem and Shaq) but for the most part people don’t find the Duncans and Big Al’s box office whereas guys like Kobe/Curry/Durant/LeBron/Wade and even, as you mentioned, Oakland native Damian Lillard are revered. Davis’ game is not even a traditional center’s game but some people still find him not-so-entertaining! (Not me, I gave him 9-9-8 in our three-category ranking). This is absolutely not to say the star guards shouldn’t be appreciated, because we all know that they are great players and fun to watch, but the ADs of the world just don’t get much love. As someone who watches the vast majority of Warrior games, I get a similar thrill off of a Bogut beautiful pass as I do a crazy Steph-back three..
Oh wait, I got a Curry 3 and a Bogut dime off of that. I guess it’s Monta Warriors-have-it-all. As for draft projections, I disagree because I remember similar pre-draft sentiments for AD that there were for KD because of size. People said that he was “very slender, even for the collegiate level” in that very projection article you are referring to. DraftExpress, on the other hand, did say his best-case scenario was Blake Griffin meets Tyson Chandler. Crazy as it may be, that could be underselling him. Fotinich: It doesn’t seem like we have much to argue in regard to Kobe’s entertainment value, though I did rank him tied for 3rd. Tim Duncan might have an argument that he, not Kobe, is the most decorated active player, but there isn’t a doubt in my mind who is more entertaining to watch. I’ve been watching Kobe since I was a kid, and I still yearn for more. Although he’s never been a physical freak such as the likes of Anthony Davis or LeBron James, he makes up for his relative lack of size and speed with impeccable footwork and timing. Guys who have been watching Kobe since they were in high school somehow still fall for his pump fakes often enough that even in his 19th season, he’s third in free throw attempts. He does take some (OK fine, many) misguided shots, but when they go in, even Laker haters can’t help but be amazed. If any other player in the NBA took the kinds of shots that Kobe makes regularly, they would be shooting below 30% for their career. There isn’t a player in the league right now who can hit shots on a double team like prime Kobe did. Admittedly, 2014 Kobe isn’t prime Kobe, but he’s pretty close. If those words don’t describe just how entertaining Kobe Bryant is, maybe numbers will: $48,500,000. That is how much Kobe is getting paid over the widely panned two-year extension he signed in November 2013. Most critics of the extension focused on how it supposedly prevented the Lakers from signing notable free agents this summer (as if both LeBron and Melo were coming to LA regardless), but these critics missed a crucial point. 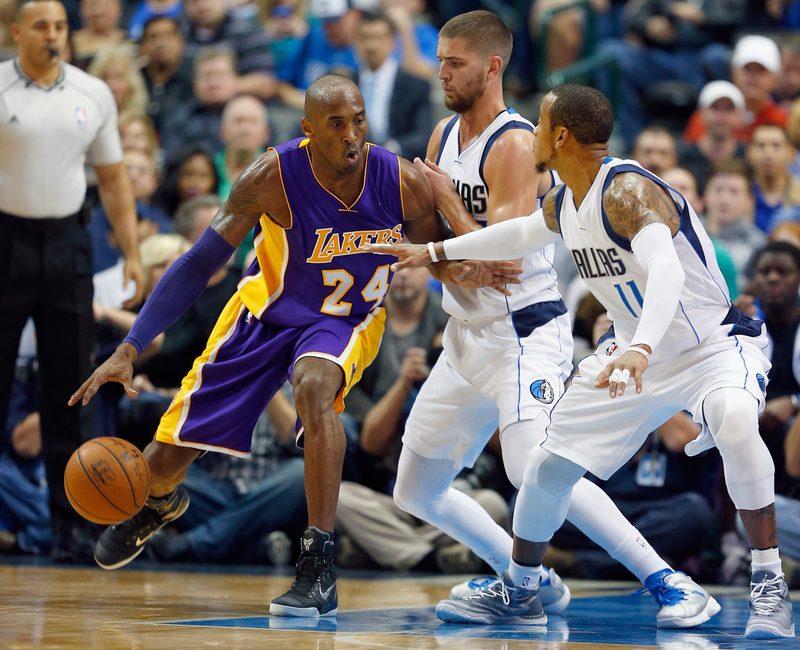 Kobe is being paid because people pay lots of money to see Kobe Bryant play basketball. The Clippers are a championship contender, feature superstars Blake Griffin and Chris Paul, while the Lakers might not win 25 games this season. Somehow, Laker tickets are still selling for significantly more than Clipper tickets on StubHub. Kobe is entertainment personified. Many people would argue he should be no. 1 on this list. I want this out here for the record. He is shooting 39.2% from the field right now. 28% from three. Basketball is a game of efficiency. I’ll save this for perhaps another column but there’s no weasling around it...these are putrid numbers. The fact that Kobe can make shots fading away in the corner where the ball comes from behind the backboard is box office but serves no legitimate basketball value when he’s making less than 40% of those types of shots. It’s good that you see he takes awful shots, but to say that it’s impressive when he makes a few...not sure. Statistically speaking, he’s bound to make some of his crazy shots. And yes, he’s third in free throws, but that’s meaningless. His usage rate is a league-leading 36.4%!! I looked up volume in the dictionary the other day and there was a picture of Kobe Bryant staring back at me. One last clarification: you meant to say that many Kobe fans (and/or Laker fans) would argue he should be no. 1 on this list. 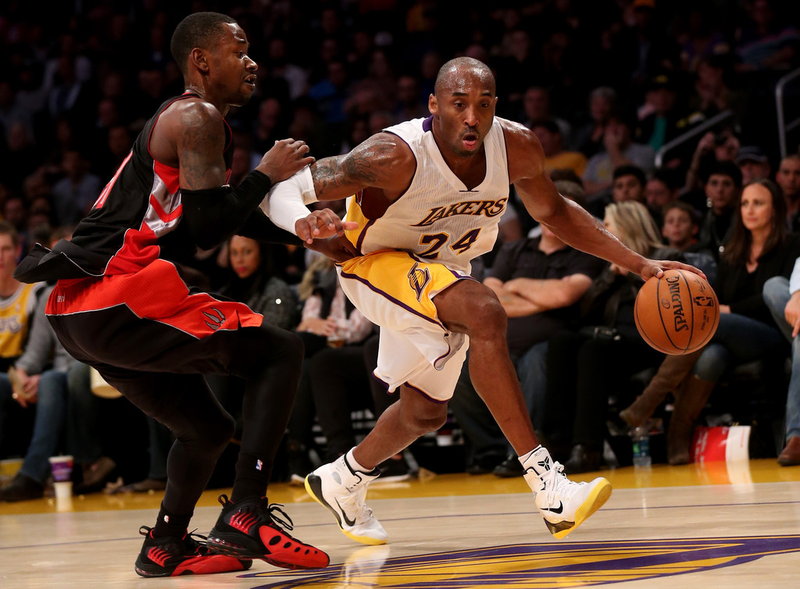 Fotinich: I can’t disagree regarding Kobe’s shot selection this year. I attended the Lakers-Warriors tilt several weeks ago when Kobe scored 44 points while the Lakers lost by 21. Since it was the first time I ever had premium seats to a Lakers game, I wanted to get a good photo of Kobe shooting. Thankfully, I had plenty of opportunities. Kobe took 24 shots in the first half alone - more shot attempts than anybody else is currently averaging over an entire game - finishing with 34 shots despite sitting out the entire 4th quarter. Plenty of these shots were double-teamed long-two’s, deep 3s, well-covered layups, etc..basically, the types of shots that appear in the nightmares of any high school basketball coach and Daryl Morey. Despite that, the audience visible tensed whenever Kobe attempted a shot, and erupted in cheers every single time one went in. At one point, he even got a small “MVP!” chant while shooting a free throw (which he then missed, preventing the chant from going for the second free throw). Realize that we are watching a player in his 19th season, after having played over 46,000 regular season minutes and coming off of two major injuries, score over 20 points per game while competing with guys significantly more athletic than him. This is history in the making; don’t even attempt to find a better 19th season from an NBA player - you won’t find one. Kobe might not lead the Lakers to any sort of relevance this year, but the fact that he’s still able to play the way that he does is remarkable.